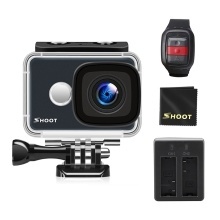 4K Ultra HD Action Camera: Professional 4K 25fps & 2.7K 30fps video with 14MP image resolution. 2.4G Wireless Wrist Remote Control: Support 2.4G wireless remote controller, it is ultra convenient for you to control the camera, Photo Shot or Video Record and Power off button. Full control your Sports Camera with the remote. Mobile APP Control: Just download the APP "SHOOT Camera" from "Google Play" or from the Apple "App Store" on your phone or tablet and connect with this action camera. Then operate or review or download the images and videos via your phone or tablet. Longer Battery Life: SHOOT action camera comes with 1pc built-in removable rechargeable 3.8V/1000mAh battery and 1 USB dual battery charger. Each 1000mAh battery can record up to 90 minutes. You don&apos;t need to worry about the recording time for this action camera. Waterproof Up to 45M: Camera comes with a pretty waterproof case which supports for underwater sports up to 45m. It helps you capture your every fantastic underwater sports moments like swimming or diving.